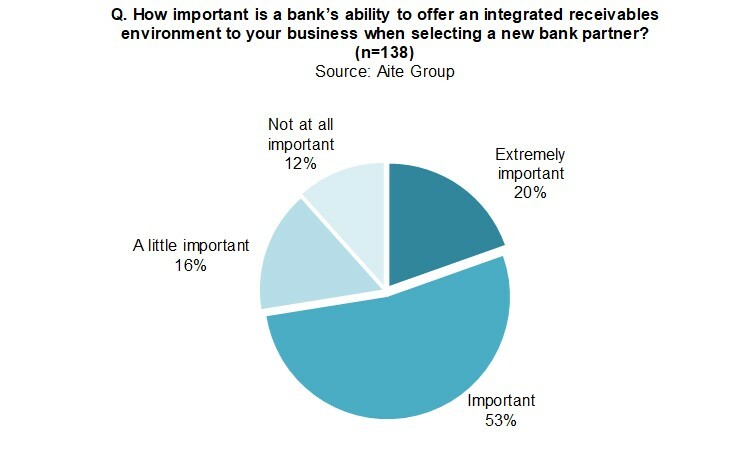 Corporate customers are investing in integrated receivables, even if their banking partners are not offering a solution. Boston, January 18, 2018 – Business-to-business payments’ shift toward electronic payment vehicles is building and forcing businesses to look for more efficient ways to receive and consolidate payments. Many corporations seeking higher levels of automation have an immediate need for an integrated receivables solution to automate remittance matching and remove manual processes for posting payments. But could corporate adoption of this technology outpace bank rollouts? This Impact Note explores why corporations need integrated receivables, indicates their adoption to date, and identifies the key pain points and needed features. Based on an October 2017 Aite Group survey of corporate treasury professionals at 145 U.S.-based corporations, it is the second in a series of reports covering this space. Find the report highlighting bank initiatives around integrated receivables here. This 19-page Impact Note contains 11 figures and one table. Clients of Aite Group’s Wholesale Banking & Payments service can download this report, the corresponding charts, and the Executive Impact Deck.